We have been secretly planning a swimming adventure for this weekend and we are finally ready to release details for anyone who wants to follow our progress or join in. 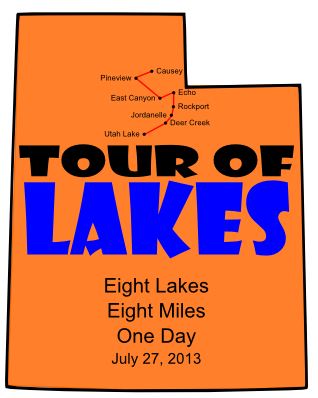 The "Tour of Lakes" will take place this Saturday July 27, 2013. It will be an all day trip consisting of swimming 1 mile in eight lakes starting at Causey Reservoir in Weber County and finishing at Utah Lake in Utah County. Anyone is welcome to join us for all, or part, of the adventure. The schedule of our stops is posted below and a more detailed plan with maps and other information can be found here. If anyone wants to come along for the whole adventure, we may have a few seats left. Otherwise you would have to provide your own transportation. If you just want to meet up with us at one (or a few) stops, you should be able to figure out where we are based on the schedule and maps. This is meant to be a social event and not a competition. However, we will be very strict with the 30-45 minute swimming time limit at each stop so that we can make all eight lakes before it gets dark. We have one scheduled lunch break and will celebrate our accomplishment with dinner following our last swim at Utah Lake. For those who would like to follow our progress online, we will post a SPOT GPS tracking page and will also be posting regular updates on Facebook, Twitter and Instagram with the hashtag #touroflakes. Leave a comment below or send me an email at joshuakgreen@gmail.com if you are interested in participating.